We're (not) all going to die! Wali Rahman leaves the Criminal Justice Center in Philadelphia on September 27, 2017 after learning that his trial has been delayed. He is charged with vandalizing the Frank Rizzo statue. The rule of law is crumbling in Philadelphia, they hemmed. The inmates are literally running the criminal justice asylum, they hawed. We are all in danger! Save yourselves while you can! That’s how the screams translated. Does Frank Rizzo statue deserve special legal protection? If marijuana available anywhere, why bother raiding 'Smoke Session' party? Well, if what they maintained was true, the best vantage point to watch the official crumbling of law and order in Philadelphia would’ve been Wednesday morning on the ninth floor of the Criminal Justice Center. Sure, there was a different aura hovering in the air. That happens anytime a new leader takes over an established bureaucracy like defense attorney-turned-District Attorney Larry Krasner did just eight days ago. And sure, you didn’t need to listen too closely to hear a defense attorney laughing about how Philadelphians locked up in state prisons were “cheering like the Eagles scored a Super Bowl touchdown” when news broke of Krasner unceremoniously canning a couple dozen members of his prosecution army. But gut feelings are gut feelings, and whisper-down-the-lane stories are just those. If inklings were to become realities, a pair of cases on the docket could’ve very easily served as launching pads. In Courtroom 903 sat Wali “Diop” Rahman. The activist and one-time mayoral candidate was there to face trial on charges filed after he was apparently caught spray painting “Black Power” on the controversial Frank Rizzo statue in mid-August. A few steps down the hall in Courtroom 905 sat Richard Tamaccio – aka weed activist N.A. Poe – who was faced a laundry list of charges stemming from a high-profile marijuana party raid in the city’s Frankford neighborhood last April. His support team consisted solely of his girlfriend. Those hot-button issues have become hotter thanks to a White House that speaks ill of anybody who uses, and harbors feelings, related to both. If the rule of law were truly dead, doomsday criers would tell you that both defendants were not only about to be cut loose, but drenched by celebratory Gatorade showers on Filbert Street by liberals hell-bent on redefining the heart and soul of a metropolis. Spoiler alert: none of that happened. 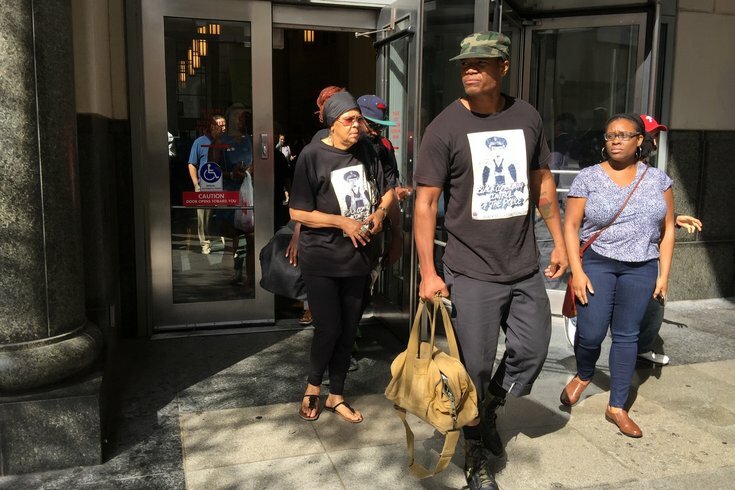 It was a day that Rahman scheduled a press conference outside the courthouse demanding, among other things, that “everyone who was framed by (former DA) Seth Williams needs to be released,” “jail ALL the killer cops” and “drop ALL charges” against himself. Like Coard, who was down at the federal courthouse handling a case on Wednesday, co-counsel Bert Elmore is on the record supporting Krasner’s candidacy and election. Shouldn’t that type of alliance have resulted in charges of criminal mischief, possession of an instrument of crime, institutional vandalism and intentional desecration of a public monument being dismissed outright for Rahman the first chance the prosecution had? I’m sure some would argue that’s the case, but reality had different ideas, namely that the trial was postponed until March 16 to afford both sides the opportunity to prepare their cases. As for those rumors of deals being cut? Down the hall a deal was cut, though. It wasn’t a clean break by any stretch of the imagination and both sides held that the shift in prosecutorial leadership had nothing to do with it. 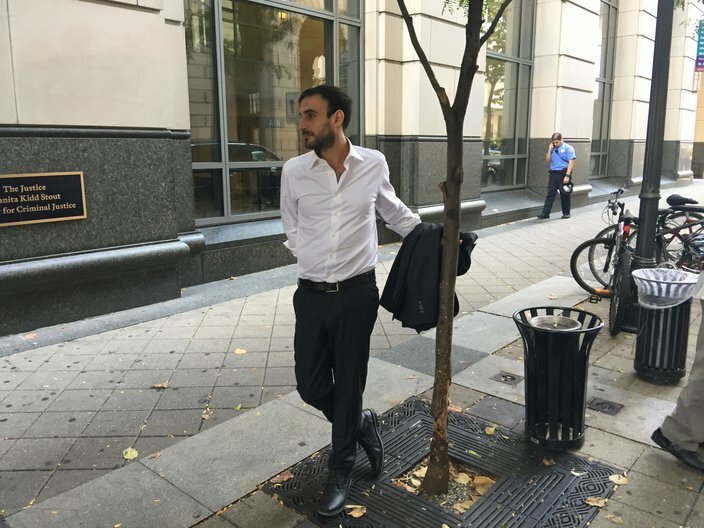 Outside the Criminal Justice Center, Richard Tamaccio considers what just happened inside when a judge held him over for trial on charges stemming from an April 'Smoke Session' marijuana party in Frankford. • Conspiracy to do all of the above. • Possession of an instrument of crime with intent. • Recklessly endangering another person. • Criminal use of communication facility. All of that was on his prosecutorial plate when he walked into court. Just two charges – possession with the intent to distribute and conspiracy – remained by the time he walked out around 11:15 a.m.
They’re a duo of felonies, punishable by up to a decade in prison, which is hardly a pro-weed wrist slap. They were what was left, thanks to a deal worked out by Assistant District Attorney Ryan Slavin and defense attorney Chuck Peruto. Sentencing is scheduled for March 21, and there will be punishment, even if it’s as minimal as the no-jail-time prediction proffered by Peruto. Slavin told me he’d been talking to Peruto about this for a while now, and that he was content that Tamaccio accepted responsibility for breaking the law. What I took that to mean was that he got no marching orders from his new boss on the deal, which would now enable him to focus on heftier cases surrounding drugs like heroin. What I also took it to mean it was legal business as legal business has long been conducted in Philadelphia. “I’m relieved, but not happy,” Tamaccio said. Peruto seemed a little happier. The expected lack of prison time, the discarding of the catastrophe and REAP charges and the fact that Tamaccio won’t face penalties for having roughly a pound of weed in his place across the street from a South Philadelphia high school spoke to logic rather than a crumbling law-and-order ethos. You know, just like how logic had nothing to do with paranoid claims that the CJC, and Philadelphia itself, is already turning into a criminal justice hellscape.